Herbert De Smet was born in Gent (Ghent) in 1965. In 1988, he graduated in physics engineering at Ghent University, where in January 1994 he also obtained his doctoral degree. His PhD thesis was titled "Poly-Ge/poly-CdSe thin-film circuits for on-glass integrated driving of flat-panel displays". This thesis is available as a pdf-file. In 1995, Herbert started working for imec. Today, he is involved in several research projects concerning smart lenses and tunable opto-electric components. In 1997, He married Sofie Van Calster. She is an engineer-architect and has a " house page" (in Dutch). From October 2000 to September 2007, Herbert was a part-time assistant professor (docent) at Ghent University in the domain "Microsystems and sensors". 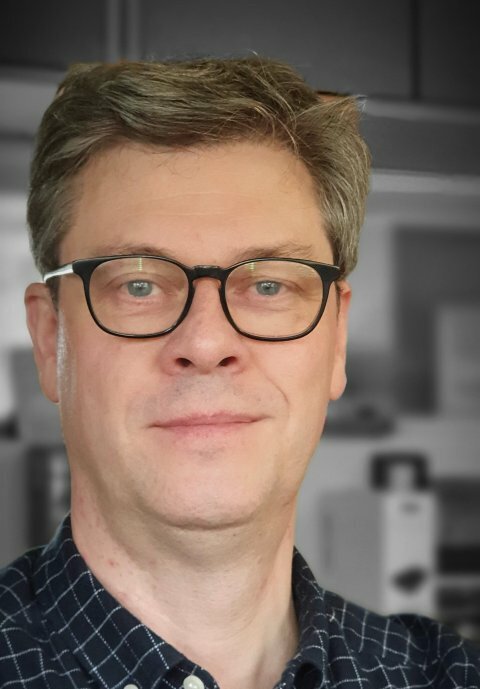 From October 2007 to September 2014, he was a full-time associate professor (hoofddocent) at Ghent University in the domain "Integrated intelligent sensors and metrology". Since October 2014, he is a full professor (hoogleraar) at Ghent University in the same domain. Since October 2018, Prof. De Smet is Chair of the Public Relations Committee of the Faculty of Engineering and Architecture of Ghent University. Since 2011, he is the Director of the Mid-Europe chapter of the Society for Information Display (SID). From 2015 to 2018, he was also the Editor in Chief of the Journal of the Society for Information Display (JSID)(Wiley). Herbert De Smet is the author or co-author of more than 200 publications and has supervised 11 PhDs.